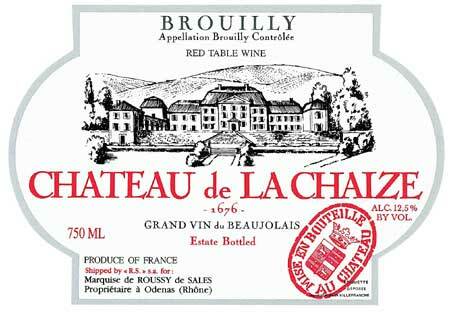 Chateau de La Chaize produces France's best known Brouilly, which is one of the most elegant of wines from the largest of the ten individual vineyard appellations in the Beaujolais district. The wine is produced from 100% Gamay Noir, sourced from vines 3 to 70 years in age. (50% of the vines in the vineyard are over 30 years old) The wine is aged in wooden casks for 6-8 months in the famous vaulted cellars of Château de la Chaize. On the nose I get fascinating aromas of cherry, cranberry, rose pedal, earth, mineral, sandalwood, smoke, and game. It's a bouquet that becomes quite floral and complex as the wine warms in the glass. On the palate the wine is tart and fruity, and shows some really nice light cherry and cranberry flavors. This is definitely made in a very "old world" and uniquely European style. It's the kind of red wine I would expect to be served at a local eatery in the heart of Burgundy. There is a rustic, but very delicate nature to this wine that I really enjoy. Behind the tart red-fruit flavors this wine is lined with a good amount of acidity and some really nice mineral and earthy tones. What I'm most impressed about with this wine is that after six years it's drinking magnificently. This is easily the most age-worthy Beaujolais I have ever tasted. The acidity is very reminiscent of many of the premium village wines of Burgundy. In fact, if I was given this wine in a blind tasting I would almost inevitably guess that this was Burgundy from the cote d'or. It doesn't necessarily taste like Pinot, but it really doesn't taste anything near to what I've experienced with Gamay in the past.